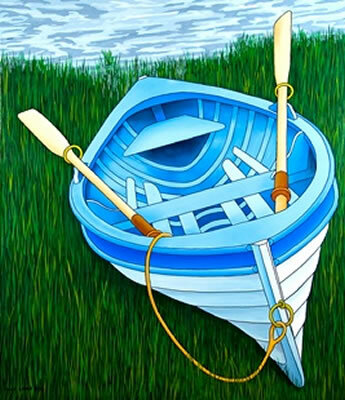 The painting is 3.5 ft x 4.5 ft acrylic on canvas and has been used for several marine event posters including the 2005 Vancouver wooden boat Festivals, Ucluelet marine festival, and the Silva bay maritime festival. If you come across any old black and white photos of BC's working water front you will often find a Pea Pod - because of their speed and agility the pea pod design was the work horse for many years and was used for ferrying product and people from ship to shore. I am building a replica, after taking the lines (measurements) of the one used for the painting.